PRODUCT: GUARDIAN # 000440 "T-T BOSS" GRAY COLOR TILE ROOF ANCHOR KIT (Truss Anchor, Aluminum/EPDM Flashing, GRAY Top Cap / Boot and fasteners). PRICE/KIT. Flexible aluminum flashing with vulcanized EPDM Rubber. 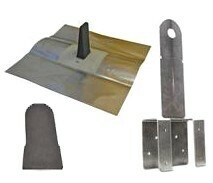 GUARDIAN #000420 TRUSS BOSS KIT GRAY CAP COLOR ROOF ANCHOR KIT (Truss Anchor, Base Flashing, GRAY color Top Cap / Boot). PRICE/KIT.